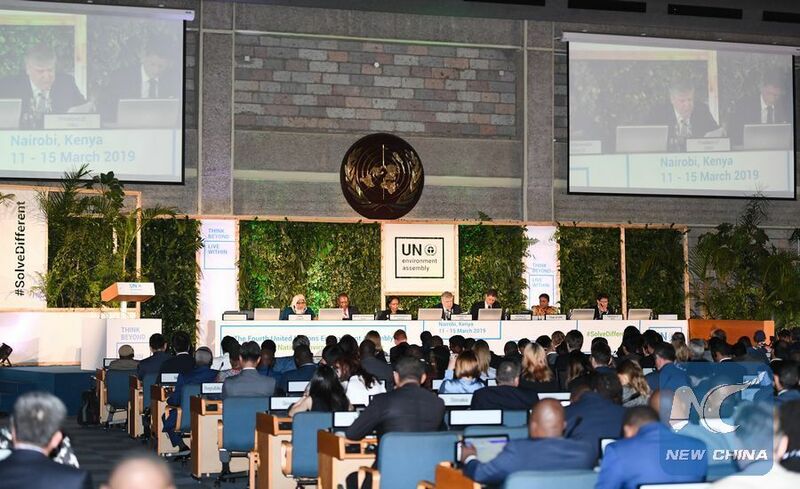 NAIROBI, March 11 (Xinhua) -- The fourth session of the United Nations Environment Assembly (UNEA) opened in Nairobi on Monday with a rallying call for adoption of technologies and innovations to boost green and inclusive growth. More than 4,700 delegates, including presidents, ministers, business leaders, scientists and innovators, will be attending the gathering that is expected to adopt resolutions that will help leapfrog societies to a more sustainable future. "We know we can build more sustainable, prosperous and inclusive societies with sustainable consumption and production patterns that address our environmental challenges and leave no one behind," said Siim Kiisler, Estonia's minister for environment and president of the fourth session of UNEA. "But we will need to create the enabling conditions for this to happen," Kiisler said in his opening remarks. "We will need to do things differently." The theme of this year's UNEA that runs through March 15 is "Innovative solutions for environmental challenges and sustainable consumption and production." French President Emmanuel Macron, his Kenyan counterpart Uhuru Kenyatta and other world leaders will on Thursday headline the One Planet Summit that focuses on innovative measures to promote climate resilience. Other landmark events expected at the five-day assembly will be the launch of the sixth edition of Global Environment Outlook, which will shed light on the status of the planet's health. Keriako Tobiko, Kenya's cabinet secretary in the ministry of environment and forestry, said adoption of cutting-edge technologies and innovations is key to tackling pressing environmental challenges like plastic waste and degradation of habitats. "Innovations are urgently needed to tackle pollution and adverse impacts of climate change on our planet," he said. "We must also give priority to cleaner production and promote resource-use efficiency as a prerequisite to achieve sustainable development," Tobiko added. Joyce Msuya, acting executive director of United Nations Environment Program, said that policy and regulatory incentives are required to boost uptake of innovations to reduce carbon emissions and restore degraded ecosystems. "The potential of innovations to address poverty and environmental challenges cannot be under-estimated," she said. "We therefore require good policies to foster innovations and sustainable practices."